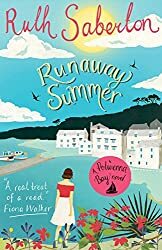 Since leaving Polwenna Bay for the bright lights of London, actress Summer Penhalligan has tried her hardest to never look back; Jake, her childhood sweetheart, let her down terribly and the beautiful Cornish village holds nothing but painful memories. It’s only when a volatile relationship threatens to destroy all she holds dear that Summer finds herself returning to the place she knows so well. As the holiday season approaches and seaside life gathers pace, Jake suspects that Summer is keeping a huge secret from him. But Summer is not the only person in the village with something to hide. Is she just an echo of Jake’s past or are there far more important matters at stake? I was very excited to read and review this book by Ruth herself as I have read some of Ruth’s books before and they are brilliant. From the very first page I felt drawn into the story, there is romance, humour and some really lovely characters who I felt I connected with. The cover looks amazing, really summery and I look forward to the next book. A perfect chick lit for a summer holiday. You won’t be disappointed.